Bistro salad is a simple but glorious combo of bacon, egg, lettuce and your favorite vinaigrette, with a little bread and cheese. Easy and elegant! Oh, how I love this easy and elegant recipe for bistro salad! If you can fry an egg (and click here for my perfect fried eggs recipe!) then you can make this lovely, swanky number that is light and delicious and colorful and ready in two shakes. This is one of those dinners (and sometimes lunches) that I always have on call for those days when I have run out of clever ideas for what to make for dinner…or those nights when whatever clever idea I DID have on the menu happens to land on One Of Those Days. Ready for some bistro salad deliciousness? Let’s make it! So here’s the scoop: you cook up a few pieces of bacon however you like to make it. I always recommend baking it in the oven…it always comes out perfectly and a lot less messy than the stove…and here’s my friend Robyn’s perfect perfect bacon in the oven recipe. Mix up a quick and easy mustard dressing, which you are going to drizzle on in a few minutes. Fry up as many eggs as you have people. Or poach them if you are more of a poached egg person, and click here for my easy, 100% guaranteed method of egg poaching. Bistro salad is a simple but glorious combo of bacon, egg, lettuce and your favorite vinaigrette, with a little bread and cheese. 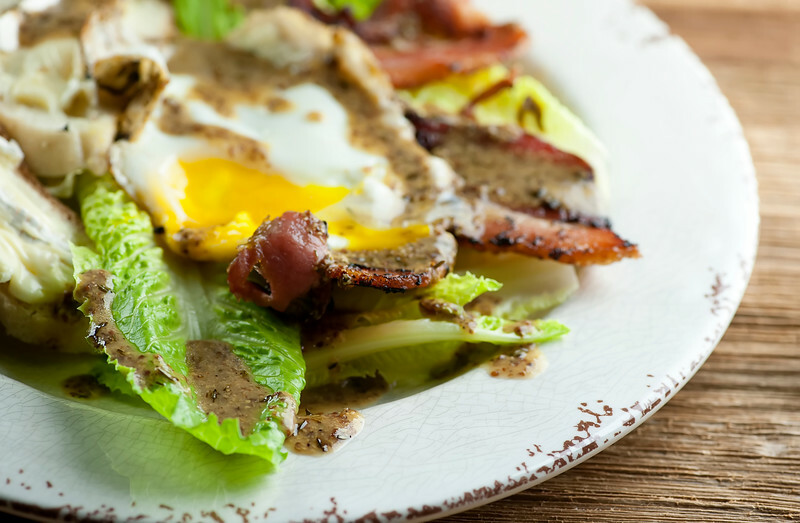 Easy and elegant!Click to TweetThen it goes like this: bed of lettuce, layer on some bacon, pop an egg on top, drizzle on your dressing, and top it all off a little fresh ground pepper. If you cook the egg so that the yolk is not too firm, the egg will add to the dressing and you are in Bistro Salad Heaven. Your favorite spreadable cheese — Brie, Boursin, etc. First, make dressing by processing vinegar, mustard, shallot, garlic, thyme, 1/2 teaspoon salt and 1/2 teaspoon pepper in blender or small food processor for 15 seconds. Add oil and process until emulsified, about 15 seconds. You too my friend! xoxo! Perfect for a quick dinner Kate! I love doing my bacon in the oven too. So much less of a mess! Love the flavor profile of this salad! Looks tasty! It’s the only way to go, bacon-cooking-wise! I crave fresh, delicious salads right now. I will add this to my list! It looks delicious.